Telangana Epass Renewal 2018-19 Schedule issued for Telangana Post & Pre-Metric Scholarships. Renewal Registrations Last Date for Telangana Post Metric Scholarship has been extended to 28th February 2019. Check the information about TS e-pass Renewal status here. 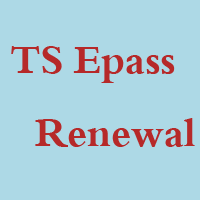 ePASS Renewal TS information available on official site also. Telangana State Epass scholarship is permitting for the candidates to the renewal of TS Epass scholarships now. Students in Telangana may TS EPASS renewal online through www.telanganaepass.cgg.gov.in On this page, we have provided complete details regarding Epass Renewal TS 2018-19 Application Registration Process. Postmatric Scholarships For Renewal Registration Last date (2018-19) – 28th February 2019 (Extended). The Govt of Telangana State has announced scholarship renewal notification for students of the year 2018 – 2019. TS Post-matric and Pre-matric scholarships for Renewal epass TS 2018 – 19 Registrations are open. The candidates have to apply for the given TS Postmatric Scholarships (epass) Renewal Registration within the given period. The Government of Telangana is providing financial support to the students who belong to the backward classes. Students who want to do their undergraduate courses in Telangana are eligible to secure the scholarship from the TS Government. The reserve category candidates who belong to SC/ ST/ BC with lower income are desirable to claim TS Epass Renewal 2018-19 Scholarship. The Eligible aspirants who are interested in claim scholarship may apply online on or before the last date declared by the Govt of TS. The scholarship will be very helpful for the poor students to complete their education. 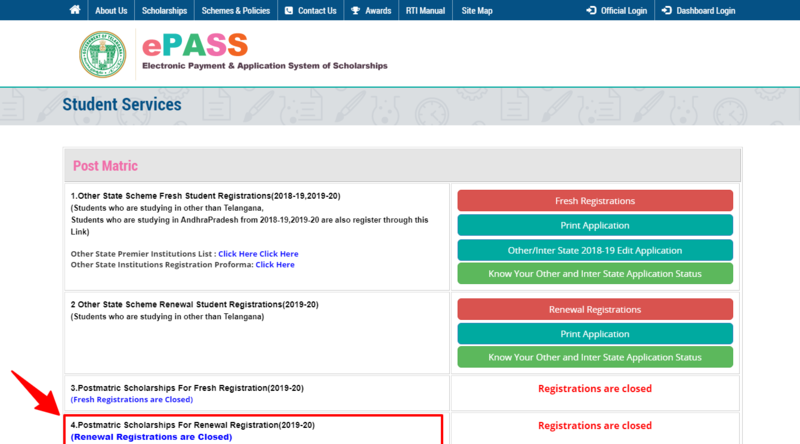 Telangana e-pass Post-Matric Scholarship Renewal Process 2018-19 Fresh / Renewal has provided below for the convenience of the students. The TS Governments have been providing financial support to the backward class students over the years through the Epass system. The contenders have to meet certain criteria to avail the scholarship. Telangana Epass Reimbursement scheme is the good opportunity for the candidates to study free in the colleges and to prove themselves. Here, the students can get the TS EPass Pre Matric Scholarship Application form along with Post Matric Renewal Registration. The students who belong to the reserved category (SC and ST) and their income should be less than 2 Lakh rupees. And they are eligible to apply for this epass. All high class & middle-class candidates can get this opportunity. TS E-pass is available for B.Tech, MBA, and MCA which will help them to get jobs in the different industries. The Scholarship is available for the students who wish to get Post Matric Courses. The Telangana e-pass system is presently being applied in 5 states. Here, we are direct you to complete the process of filling renewal applications. The students of B.Tech/ M.Tech/ MBA courses are eligible. The Renewal Scholarships and Reimbursement of the fee for the academic year 2018 – 19 can register here. So apply for the TS E pass Scholarship Renewal Registration, here we need some documents for further purpose. Many of the candidates are not aware of Epass Scholarship TS EPass Application Status. The student must be very careful while applying. So go through the epass renewal registration step by step procedure as provided below. The student should visit the official website of Telangana State Epass. Then TS Epass home page will open as shown below. Then click on ‘Student Service’ icon. It will redirect to the ‘Student Service’ page as shown below. Click on ‘TS ePass Post Matric Scholarship Renewal Registration’ option. Then it will redirect to the ‘Post Metric Scholarship Application Registration Form 2018-19’ page will open as shown below. All the aspirants must Register on the epass website. The students should have self Aadhar card. If the student does not have Aadhar Card, then go to the Nearest Aadhar Enrollment Center to Enroll. If the candidate has enrolled for Aadhar and had Enrollment Number (EID), then the candidate must verify their Aadhar status. Should have Bank Account in any of the Nationalized banks. In the case of change of any Bank account, then opens the Zero Balance account in any of the nationalized banks. The Bank account is not required for the EBC students. The student should have the Mobile No for receiving the ‘One Time Password’ (OTP) for registration purpose. Documents to be scanned and uploaded mandatory for TS Epass Renewal 2018-19 processes. The first page of Bank Pass Book with the Bank Acct no & IFS Code in the case of change. Marks Memo Sheet of Passed Previous year.